cirrhosis due to biliary obstruction, which may be a primary intrahepatic disease or secondary to obstruction of extrahepatic bile ducts; the latter may lead to cholestasis and proliferation in small bile ducts with fibrosis, but marked disturbance of the lobular pattern is infrequent. See also: primary biliary cirrhosis. 1. 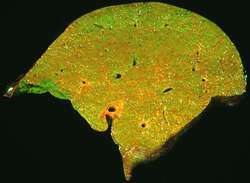 Cirrhosis of the liver caused by obstruction of the bile ducts. 2. See primary biliary cirrhosis. an inflammatory condition in which the flow of bile through the ductules of the liver is obstructed. Primary biliary cirrhosis most commonly affects women in their middle years and is often associated with antimitochondrial antibodies. Its cause is unknown. It is characterized by itching, jaundice, steatorrhea, and enlargement of the liver and spleen. The disease is slowly progressive. Treatment includes ursodeoxycholic acid. Care must be taken to rule out secondary biliary cirrhosis caused by obstruction of the biliary structures outside the liver, because the latter condition can be treated more successfully. Compare biliary calculus, biliary obstruction. Hepatic disorder due to biliary obstruction,which may be a primary intrahepatic disease or secondary to obstruction of extrahepatic bile ducts; the latter may lead to cholestasis and proliferation in small bile ducts with fibrosis, but marked disturbance of the lobular pattern is infrequent. A slowly developing liver disease in which a widespread inflammation of the small internal bile ducts causes a gradual replacement of functioning liver with scar tissue. It may be an AUTOIMMUNE disorder, secondary to obstruction to the outflow of bile from the liver, or of unknown cause (primary biliary cirrhosis). found that patients with primary biliary cirrhosis presented low spinal and femoral neck BMD and reduced fractional calcium absorption. The histology was reported as highly suggestive of primary biliary cirrhosis despite non-supportive serology. These findings are consistent with primary biliary cirrhosis, stage II (see Table I, November 2012). Hyperlipidaemicstate and cardiovascular risk in primary biliary cirrhosis. Primary biliary cirrhosis most commonly affects middle-aged women, with a female to male ratio ranging from 9 to 14 women to every 1 man. Coverage of the Primary Biliary Cirrhosis pipeline on the basis of route of administration and molecule type. Clonal expansion of EBV-infected B cells has been found in the thyroid glands of Hashimoto's thyroiditis patients, blood in SLE, cerebrospinal fluid in MS, salivary glands in Sjogren's syndrome, synovium in rheumatoid arthritis, liver in primary biliary cirrhosis and muscle in dermatomyositis and polymyositis. Women with primary biliary cirrhosis outnumber men by approximately 10:1, and most are older than 50 years at disease onset. Cholangitis/cholangiohepatitis is a potentially fatal liver disease and should be considered as a disease complex consisting of cholangitis, cholangiohepatitis and biliary cirrhosis where the tissues involved are either the biliary tree alone or more commonly the biliary tree and surrounding hepatocellular parenchyma. Other causes of cirrhosis liver are autoimmune hepatitis, primary biliary cirrhosis, Wilson's disease, haemochromatosis, a-1 antitrypsin deficiency, primary sclerosing cholangitis (PSC), granulomatous disease like sarcoidosis, type IV glycogen storage disease, various drugs like methotrexate, alpha methyldopa, amiodarone, venous outflow obstruction like Budd-chiari syndrome, veno-occlusive disease, chronic right-sided heart failure, and tricuspid regurgitation.